A.C.E. Ohio Events LLC is excited to announce it's guaranteed purse, September 14-16 at Dragway 42, in West Salem Ohio. The event consists of 3 races, with $20,000 to win each day for the weekend price of $495. Pre entries can only enter for $495 up to the Aug 31st deadline. After Aug 31st, entries will be charged the gate price of $690 for the weekend, or $230 per day. Re entries sold, first round only for $150. 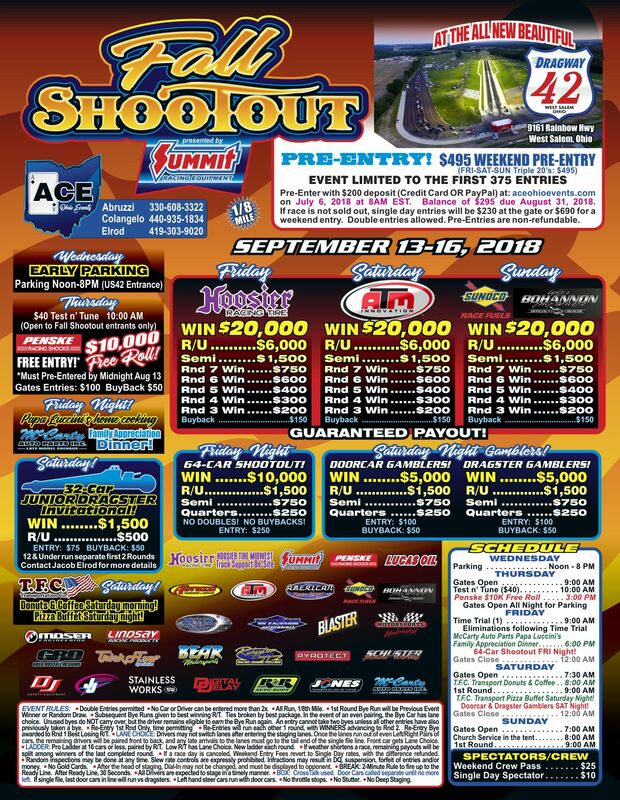 A 64 car shootout will be held Friday night, $10.000 to win, $250 to enter. No buybacks. A $5,000 gamblers race is held Saturday night, $100 to enter, $50 buybacks.